I upgraded the wiring so it is now adequate for the job it is intended for. Incorrect cable feeding consumer units has been responsible for many serious house fires, so take some time to check your wires. As you can see, the black fuse box was very outdated with no RCD protection and very little in the way of fuse protection either. It would have been very unlikely to have provided adequate protection against electrical shock and injury to the household. If your consumer unit looks similar to this, it will probably need upgrading. 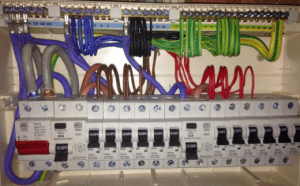 Filed Under: When should a consumer unit be upgraded?